You can find my review of Portal 2, the least necessary Portal 2 review ever published, at thephoenix.com. High praise, naturally, which is why I say it's unnecessary. The critical consensus on this one is unusual, even in an industry where heretics are swiftly and severely punished. Don't let me be the one to dissuade you: Portal 2 is damn good. Even so, I find myself in the strange position of liking the game a smidgen less than almost everyone else I read and talk to. Not a problem when writing for a more general audience, but on Twitter and in my own inner monologue, I focus more on the few things that separate us, rather than the numerous things that unite us. My complaints are all subjective, for what that's worth. The biggest: no matter what kind of nutty things Valve included in the sequel -- and you know, if you've completed it, that they included some nutty goddamn stuff -- the novelty factor is still diminished, if not entirely gone. 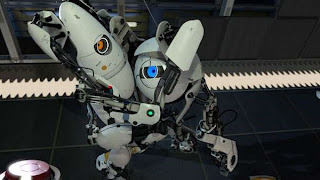 The leap from nothing to Portal 1 was much greater than the leap from Portal 1 to Portal 2, and how could it be otherwise? I felt the same way when I played Portal 2 as I did when I played Guitar Hero II and Left 4 Dead 2. It's probably the better game in every way that should matter, but its predecessor gave me a brand-new experience, and that's invaluable. Third, and possibly the dumbest: I believed in the first game. GLaDOS seemed rooted in some kind of truth -- not a literal truth, but an emotional truth. She was the perfect embodiment of automation run amok, whose behavior was dictated by implacable logic. All the jokes and the hyperbole grew from a very real place. This is not the case in the sequel, where the jokes are often just jokes. Further still, the more I listened to Cave Johnson's recordings, the less Aperture Science seemed like the inevitable endpoint of scientific research unmoored to ethics, and the more it seemed like the inevitable endpoint of a brainstorming session with a bunch of smartasses. The bull sessions may be responsible for my fourth complaint: too much talking! Sometimes I found myself wishing the voiceover of the moment would just shut up so we could get on with things. Valve's writers are too sharp to miss the mark very often, though, and there are some real gems. Something like the "edgeless safety cube" makes a real point about the power of euphemism to obfuscate the truth. (The edgeless safety cube is, of course, a sphere.) That was the sort of thinking that informed every aspect of the first game. Less so this time around. Last: Having played through both campaigns, I can't think of when I'd pick either of them up again. I could see no reason to play co-op again with the same partner. If I played it with somebody else, I could see myself trying to hurry them through it, and that wouldn't be fun for either of us. On the other hand, any DLC for this game would be a day-one purchase. There! Glad I got that out of my system. This game is sweet. Interesting point of view. I really liked Portal 2 more, I think, mainly because of the incredible voice acting. So I guess I like the more talking part! But it was definitely good to read a point of view that diverged just a little from "best Valve game ever." I can't help it, I just want Episode 3 now. I feel similarly to you, Mitch. The Cave Johnson part of the game did the mythos of Aperture a disservice in my eyes because Aperture went from being a brilliant, unethical, but overly PR sanitized corporation in 1 to an idiot savant corporation in 2. Even more, I felt like the linearity in Portal 1 was more effectively tied into the structure of the game. In 1, it feels like GlaDOS controls the experience, and when you finally escape into the claustrophobic backside of the facility, you take what you can get because you're running for your life. In Portal 2, it feels like the game exactly scripts one possible precise experience through meta-gamed tutorials and cutscenes, and there are wide-open spaces everywhere with exactly one sanitized path through them. There were many times when I had something I wanted to try that was other than what the game demanded, and I felt at odds with the game often. Don't get me wrong, the game is pretty great, but I don't think Valve learned the subtle reasons Portal 1 was so effective beyond the portals and voice acting. I think more people need to read blogs like this. Its so important to know how to construct a great blog to get people interested and youve done just that. The content is great, the videos are perfect for what youre trying to say. Really enjoyed reading this entry. I've followed your blog. If you don't mind could you follow mine? You have great information. I think that if more people thought about it that way, they have a better time understanding the issue. Your view is definitely something Id likes to see more of.